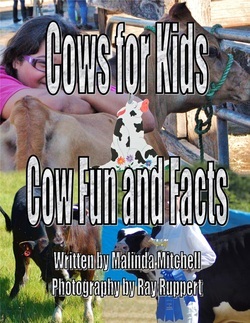 Cows for Kids, Cow Fun and Facts, is a fun filled learning experience about cattle. It’s chock-full of beautiful photos of various breeds, colors, sizes, and ages of cattle. It’s fun because you can tell what the cows are thinking! They have quite a sense of humor. It’s educational as facts are interspersed with the fun. For added enjoyment, a fun quiz is at the end of the book. Be careful, there may be some trick questions. Malinda is an accomplished author of many children’s books. She lives in Mississippi. Ray Ruppert lives in western Washington where most of these pictures were taken. This is the second book that Malinda Mitchell and Ray Ruppert have produced together.